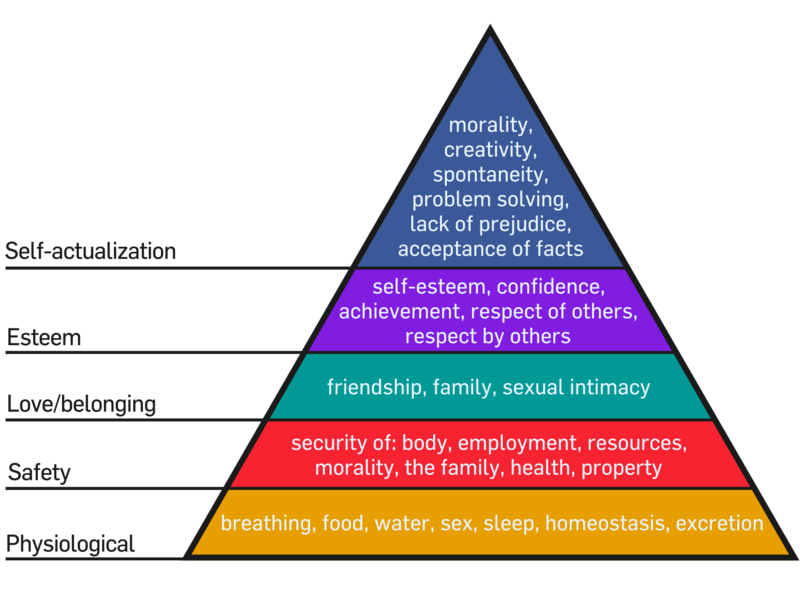 In 1943 Abraham Maslow proposed that we are motivated based on a hierarchy of needs. His theory is graphically represented by a pyramid. The basic, most important survival needs are the largest subset located at the base of the pyramid. These include food, shelter and sleep. Once these basic needs are met people are motivated by a different set of needs. The next level of the pyramid includes personal safety, followed by the need to belong and establish relationships. Cognition is located near the top of the pyramid. As educational reformers and policy makers discuss common core standards and teacher evaluations I don’t hear anyone referring to Maslow. Teachers who work in public schools confront this hierarchy of needs each and every day when directly dealing with their students. All schools have a hierarchy of needs, however different communities have different needs. The needs of a school in an affluent suburb are distinctly different from the needs of the inner city. In my last post, Walk in my Shoes, I described some of the needs that I encountered as a first year teacher working in a poor neighborhood in the Bronx. Policy makers who sit in their ivory towers don’t encounter these needs in person every day like teachers do. The stake holders, which show up as a statistic on a report in Albany, depend on policy makers to understand their needs . Policy makers that are strictly focused on teacher accountability and standards must remove their blinders. Teachers cannot simply design great lessons without micro-managing a host of other challenges that they confront on a daily basis. A great lesson by design will fail if you don’t take into account the needs of the students that sit in front of you. High standards for all are delusional at best when ignoring the needs of individual communities. Students that come from a higher socioeconomic environment will come to school ready for cognitive challenges. In contrast, students that don’t have their basic needs met may not be disposed to raise their cognitive achievement on a strict time line. If we look at Maslow’s pyramid from the view point of NYSED it appears more like an iceberg. They see the tip of the iceberg, but ignore the vast portion that is submerged below the surface. Differentiation is such a fundamental part of education. Policy that is based on a one-size-fits-all method is misconstrued. Just as that new teacher’s brilliant lesson plan is destined to fail without properly managing a host of other issues, so is the APPR process destined to fail. Turning a blind eye to the individual needs of a student or a school is just plain irresponsible.